COFFEE AT ITS BEST: Do you smell the aroma whenever you use your hot coffee maker? That's so much aroma escaping your beverage. Boiling ground coffee fills the air with its pleasant aroma; but the more aroma you smell, the lesser flavor you taste. This brewing kit is designed to brew your coffee in an airtight glass jar keeping all the aroma and flavor in your coffee. It takes longer than your usual hot coffee maker, but its half gallon jar make up for it, and its taste makes it worth the wait. LARGE 1 QUART MASON JAR: Cold brew takes longer to make. So the smaller the bottle means more time is wasted in making a cold brew. No need to worry, because this cold brew kit has a tough large glass jar, you can make up to one quart of your favorite beverage with it. And unlike hot brewed coffee which is almost useless after a couple of hours, cold brew coffee sealed and kept in your fridge will last up to two weeks without losing its fresh flavor and aroma. 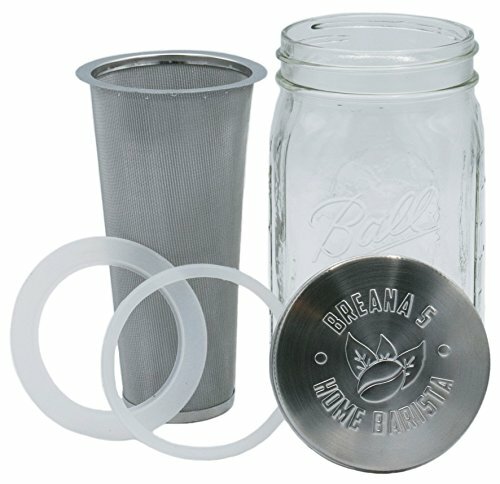 MADE OF FOOD GRADE MATERIALS: With a virtually indestructible wide-mouth Ball Mason jar, this coffee maker has a tough heavy gage, fine mesh stainless steel filter. So fine it allows no grounds or dregs get into your coffee. The lid is also made of durable high grade stainless steel which is made air tight by a silicone ring seal. All parts are BPA and plastic free so you can enjoy a pure drink without the worries of contamination caused by non food-grade materials. USE AND CLEAN WITH EASE: This cold brew coffee maker is so simple and easy to use. All you need is to put fresh coarse ground coffee into the filter, immerse it in the jar with appropriate level of water and then put on the lid with the silicone seal. Give it a shake or two, put it in your fridge and let steep for about twelve to forty eight hours. It also Cleans just as easily. If you like, you can clean the lid by hand, or just disassemble and throw everything in your dishwasher. If you have any questions about this product by Breana's Home Barista, contact us by completing and submitting the form below. If you are looking for a specif part number, please include it with your message.